If you hang around corporate America, it doesn’t take long before you start hearing what I call “corpospeak.” It usually develops for one of three reasons. It can make people believe they’re taking the sting out of an ugly or unpleasant situation. It can make people believe they’re sounding smarter than they really are. Or it can make people feel part of the hip crowd that knows how to use the latest corpospeak correctly. Sometimes, corpospeak can help foster a sense of camaraderie; people bond because they have fun with the same words. Most of the time, though, corpospeak lets people be lazy with their thoughts and speech, and it lets foggy ideas masquerade as well-developed thought. Actionable. Originally a legal word referring to anything that affords grounds for a lawsuit. Business people have perverted it to mean anything on which an action can be taken. Onboarding. The process of garnering support for a project. Also, familiarizing a new hire, which often includes orientation, filling out tax forms, training, obtaining key cards, etc. One throat to choke. Dealing with one large supplier for many items. Then if something goes wrong, there is only one company to rage at. You get the idea. Check out The Office Life for more of this drivel. Even better, let me know the corpospeak that annoys you! 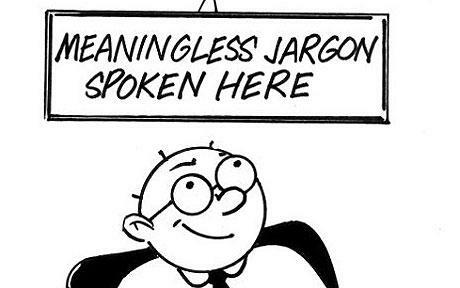 This entry was posted in Business, Communications and tagged jargon. Bookmark the permalink. Great post. We had lots of laughs reading all the words on the site 🙂 WRITE ON!